The first courthouse in Walker County was a "double-log house" at Crawfish Springs (now Chickamauga) that had been used by the Cherokees as a council house. In 1835, the county seat was moved to LaFayette and a second courthouse was completed three years later on the town square. This two-story stuccoed brick structure survived a bloody Civil War battle only to be lost to fire in 1883, taking with it 50 years of county records. A third courthouse was built the same year. Like its predecessor, it was a two-story brick structure in the centerof the square. Unlike the earier building, it had iron vaults to fireproof the records. 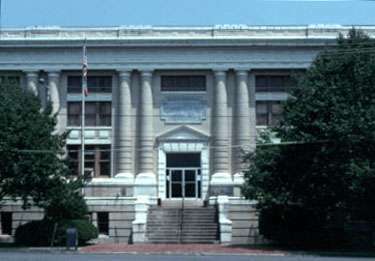 The fourth and present courthouse, dedicated in 1918, was considered at the time to be the finest in Georgia. Designed by Chattanooga architect Charles E. Bearden in the Renaissance Revival style, it was built at a cost of $80,000. The third court house fell into disrepair and was ultimately removed. The site was converted to a public park with a Confederate monument as a centerpiece. Today the area provides downtown parking while the Confederate monument stands a short distance north. to the town square in LaFayette. The courthouse is 1 block east.